Air – We can’t see it or touch it or taste it but it’s so essential for living and breathing. It’s omnipresent. But unfortunately owing to our stupidity, neglect and greed the nature is suffering and the quality of air is degrading. In turn, we suffer, our health suffers. We can’t change the big things, but we can make small changes in and around our house to ensure that we breathe fresh air. We spent a major chunk of our time inside our homes. Even with the hectic work life we do spend good 10 – 12 hours at home. We can’t make major changes to the outdoor air, but we can control the toxicity and chemical levels inside our homes. And there’s one such product which can help us make air inside our homes better and fresher so that we can breathe fresh air. I was recently introduced to Breathefresh’s air purifying bag called Vayu Bag. It’s an interesting product and the change that it brings is remarkable. No chemicals or fancy machinery has been used in Vayu Bag. It’s made for simple and sustainable clean living. Breathefresh’s mission is to raise awareness about indoor air pollution and promote a healthier life by creating cleaner indoor air naturally. For this they use various solutions – all are powerful and yet affordable nature’s hidden secrets which Breathefresh is endeavouring to bring to every household for a better, cleaner living. 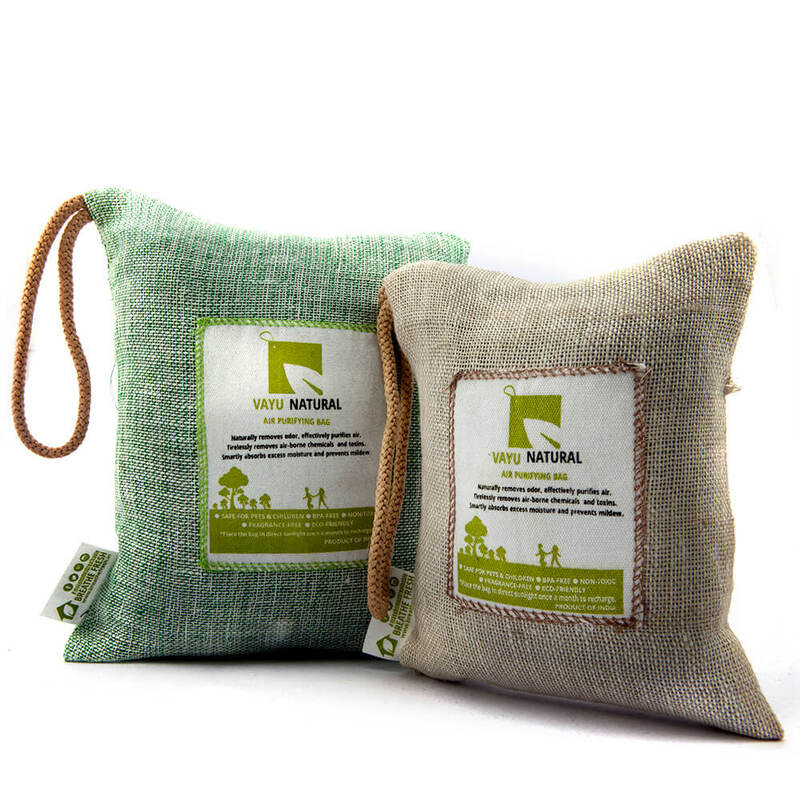 Breathefresh has products ranging from Air purifying bags to natural air purifier with anti-bacterial essential oil. They also have air purifying plants and much more. You can check out their product offerings and buy Breathefresh Vayu bag here. Vayu Bag has different applications and you can use it across your house in different ways. If you’ve recently embraced motherhood, then hang a Vayu Bag around the cradle so that it would absorb odours and bad chemicals from the surrounding area. If like me, you’ve a pet peeve of smelling bathroom/ washroom, you can use Vayu Bag in the washroom to remove bad odours and it will also help absorb the humidity in the air to make the bathroom feel fresh and not stuffy. Since it’s monsoon and I don’t like the extra moisture and humidity in the air, I’ve placed my Vayu bag in the living room close to my divan. It’s helped reduce the stuffiness from the room and I feel the difference when I enter home after a long time. It’s also made a difference in the natural odour of the room. It feels lighter and fresher. You’ve to use it to know what I’m talking about. We don’t realise how much air surrounds us. If you’ll use the product in a closet where you keep your clothes and electronic equipment such as cameras, phones, laptops, you’ll realise how much humidity the bag absorbs because you’ll feel the difference. It’ll help absorb all the bad odours from clothes leaving them feel fresh and odourless. You can use it in refrigerator, in travel bags, use it to absorb the smell and chemicals from fresh paint, in cars, and a lot more. Vayu Bag helps absorb chemicals which are present everywhere in our home in household cleaners, mob cleaners, detergents, paint, refrigerators, air conditioners, etc. Through lot of our household items chemicals get released into the air which we breathe in and let it enter our bodies. Vayu Bag helps absorb such chemicals and protects us from their harmful effects. I’m happy with the effectiveness of the product and will surely recommend this to everyone who wants to breathe fresh air and make their homes more breathable. I’ve bought the product from Amazon, you can also find it here. Do share your views in the comment section below.